As far as horror comedy goes, “The Mansion” is one that’s lampooning every genre cliche possible. However, while doing so, it implements such a heavy kind of humor that the screening quickly turns into a bore. A bunch of students drive all the way to a stunning mansion. They are supposed to spend the New Year’s Eve there and have an unforgettable stay. Unfortunately, they soon realize that the spacious house is filled with dark forces. Let me begin with stating that I’m personally a huge fan of horrors-gone-wrong. A true gold mine of such films are the glorious 50s and 60s, when cheap monster movies were rocking the screens.Rubber monsters and over-dramatic acting with scripts all over the place – those were times. Unfortunately, there aren’t many titles of this kind nowadays. It doesn’t mean that every horror movie is blood-curdling and memorable. The modern horrors are often “embellished” with comedy elements, but – more often not – it’s a desperate attempt at repairing a lacklustre story or other faults in the film design. Filmmakers, who produce these movie, aim for a slapstick vibe, but usually miss that target miserably. It’s the exact case of “The Mansion”. The director Tony Datis wishes for a surreal farce, where viewers can’t really tell whether it’s all somebody’s wicked nightmare or a deformed version of the reality. Either way, the whole concept is to leverage this blurred line separating these both extremes and keep the story ambiguous. 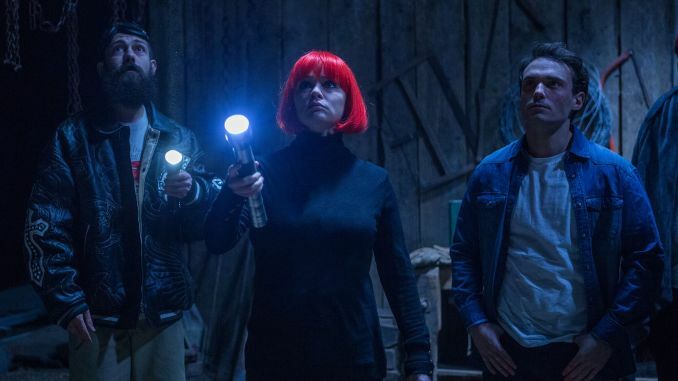 It’s supposed to be a “Cabin in the Woods” – a facetious, playful “poke” at all the sulking horror movies that usually land a tremendous score between 3 and 4.5 on imdb. Unlike the witty movie starring Chris Hemsworth, Datis’ film doesn’t deliver any brilliant irony. “The Mansion” is packed with references and ideas drawn from its predecessors, but it’s all very hard-nose and ill-inspired. As an example, Datis makes a reference to Lars von Trier’s “Antichrist” and the talking animals. In “The Mansion” a wild boar speaking Spanish (why Spanish?) warns one of the characters against the unspeakable evil waiting in the titular building. It’s out of the blue and makes no sense at all, but hey – it’s a wink to the viewer, right? The comedy is pitiful too. Most of the time, it reaches the “depth” of “”Scary Movie” franchise, with high-on-everything dudes, wacky jocks and overly sexual girls getting their piece of unfunny lines. “The Mansion” is, therefore, like watching the music video of “Pope of Dope” in order to find its deeply hidden meaning. But, all of the people who know this gem, are aware that there’s nothing underneath. Maybe apart from drugs. Datis has got little to say about the wackiness of the modern horror. His film is too dumb to be an ironic look at the genre cliches. Even when the characters in the film are supposed to be acting stupid and brainless, “The Mansion” doesn’t pass the test of a self-aware satire. The story is completely flavorless, the characters create no real bond with the viewers and the “killer” is a total let-down. Without a reasonable amount of scares and with humor heavy as a serial killer’s conscience, “The Mansion” is literally for nobody. It’s just another Netflix acquisition, done to expand the vast list of titles in the catalogue. Trust me, you will live without it.